HomeNewsWheelchairs on grass, you cannot be serious! You can be excused for thinking Wimbledon is nearing its nail-biting end with the finals in sight, but in reality, it's only just getting started. The world's best wheelchair tennis players are about to take to the court and the British players have titles to defend. Here's the lowdown on the latest championship at SW19. 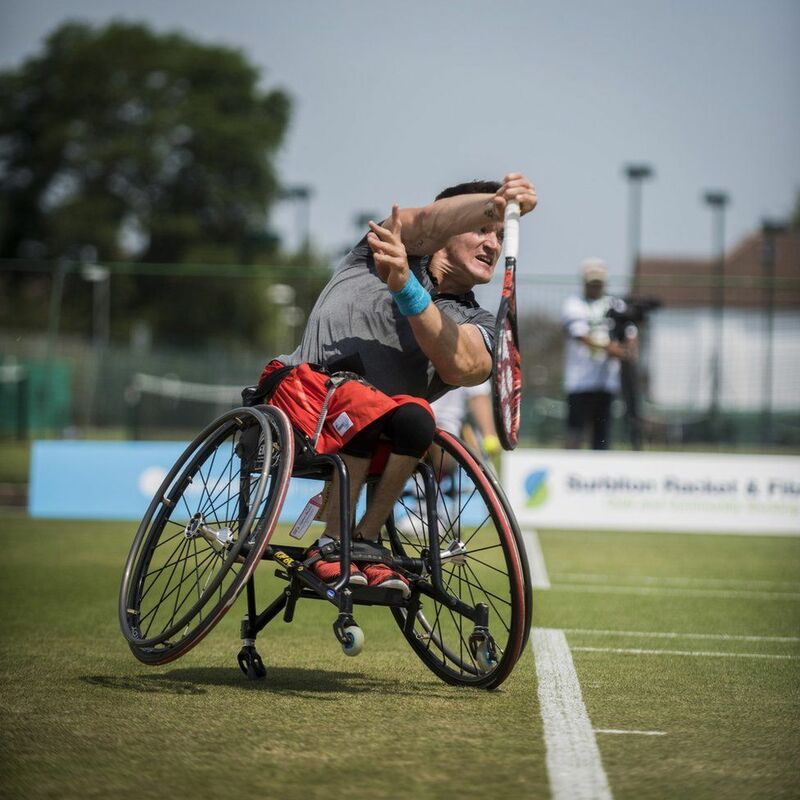 Wheelchair tennis is for men and women who are disabled below the waist and use wheelchairs to compete in the singles and doubles championship. The size of the courts, balls and rackets are the same, but the ball can bounce twice before you hit it and the wheelchairs are bespoke. 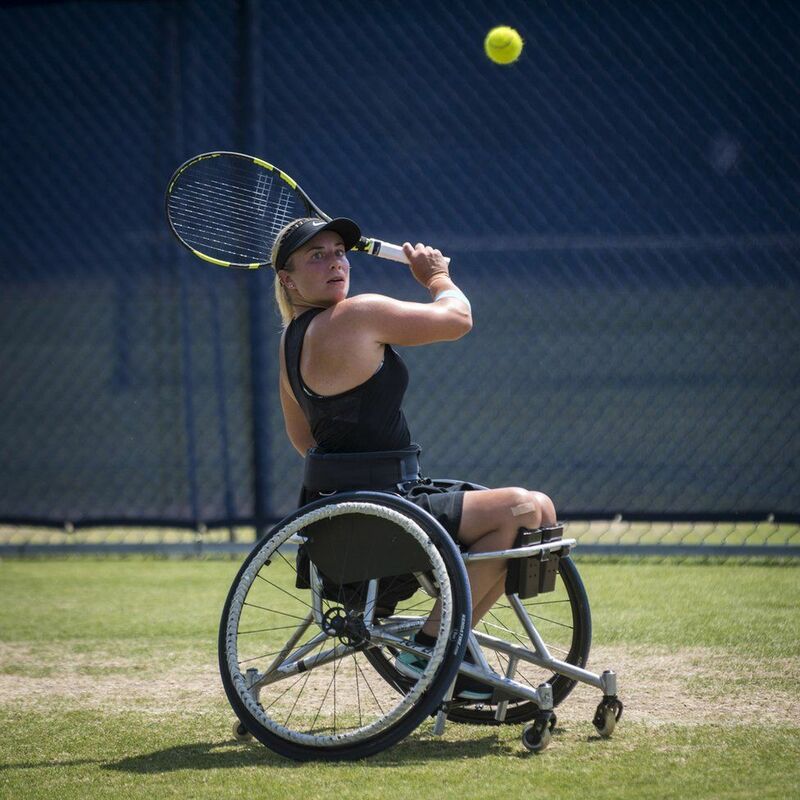 British number one, Lucy Shuker says: "The wheels are cambered out at about 22 degrees, they have wheels at the front and back so it means, in theory, you shouldn't tip out backwards. I've got straps around my waist and knee guards which lock me in place." 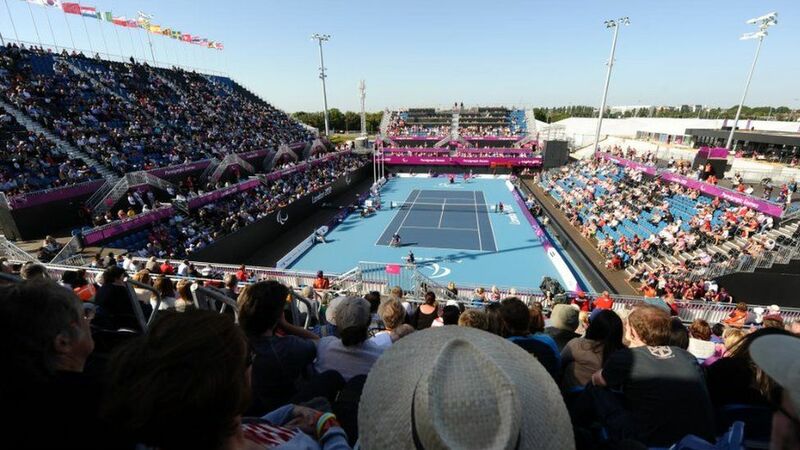 Geraint Richards, performance director of GB Wheelchair Tennis says the players "literally zoom around the court". He says: "Gustavo Fernandez, the reigning Australian Open champion, will actually fall out of his chair and still win that point. The audience will be amazed." Wheelchairs on grass, you cannot be serious! 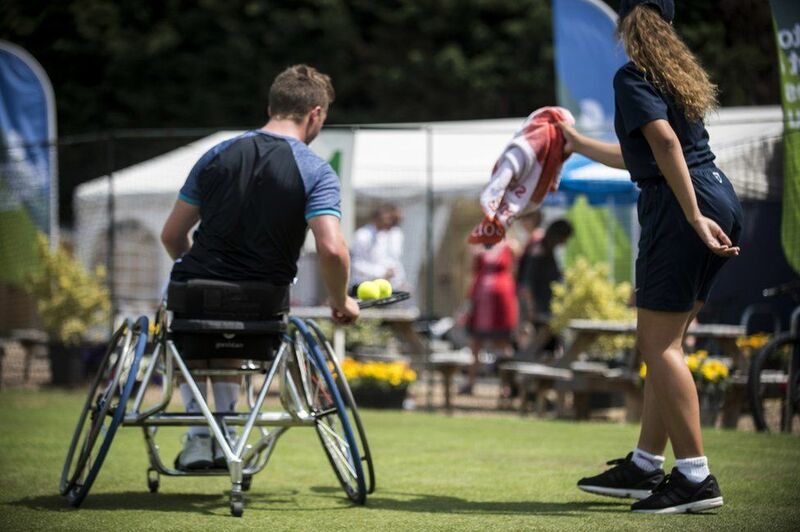 It might seem odd, but the wheelchairs do take to the perfectly manicured courts. "It's hard work," Shuker says. "The bounces aren't necessarily true and where you think you're going to take a ball at shoulder height it's probably going to bounce a lot lower. "There's a definite drag on grass and you have to continually keep pushing otherwise the chair will stop." But she reveals drop-shots work well as your opponent probably wont get there in time. You bet we are. British players are currently Paralympic, grand slam-winning, world-rank topping, Wimbledon champions in both the singles and doubles. Reid, 25, is the defending Wimbledon singles and doubles champion. 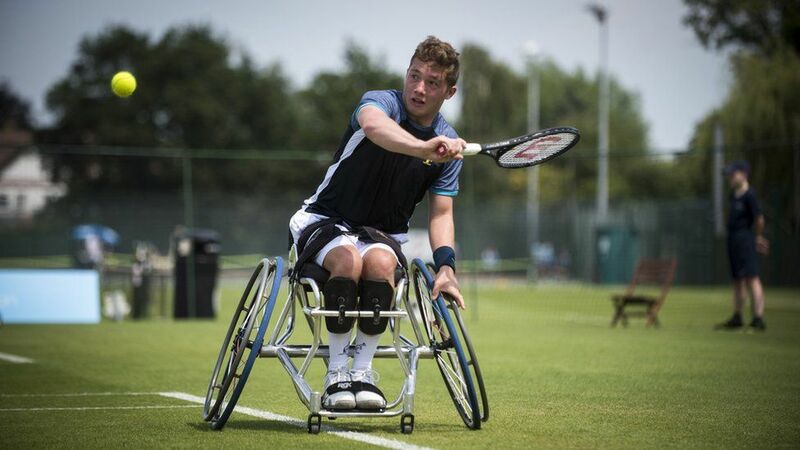 He won Paralympic gold in the singles at Rio and silver in the doubles with fellow Brit Alfie Hewitt. 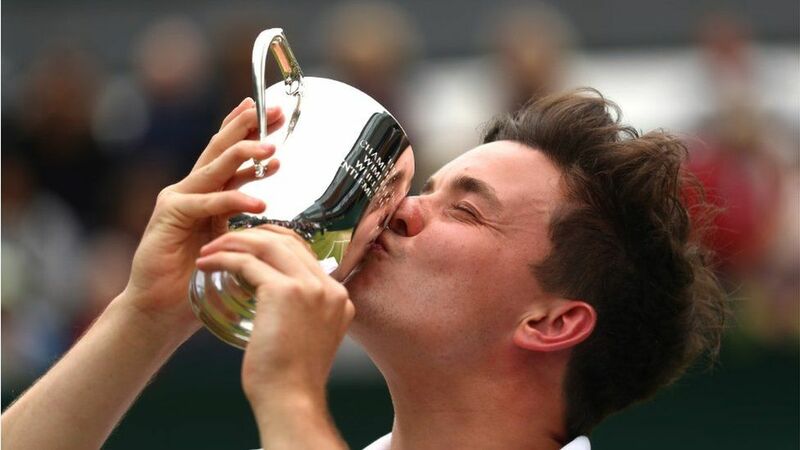 In 2007, aged 15, Reid became Britain's youngest men's Singles National Champion and in 2016 he won his first grand slam singles title at the Australian Open, followed by Wimbledon. Reid is from a tennis family. Aged six he contracted Transverse Myelitis a neurological condition in which the spinal cord is inflamed and damages nerve fibres. 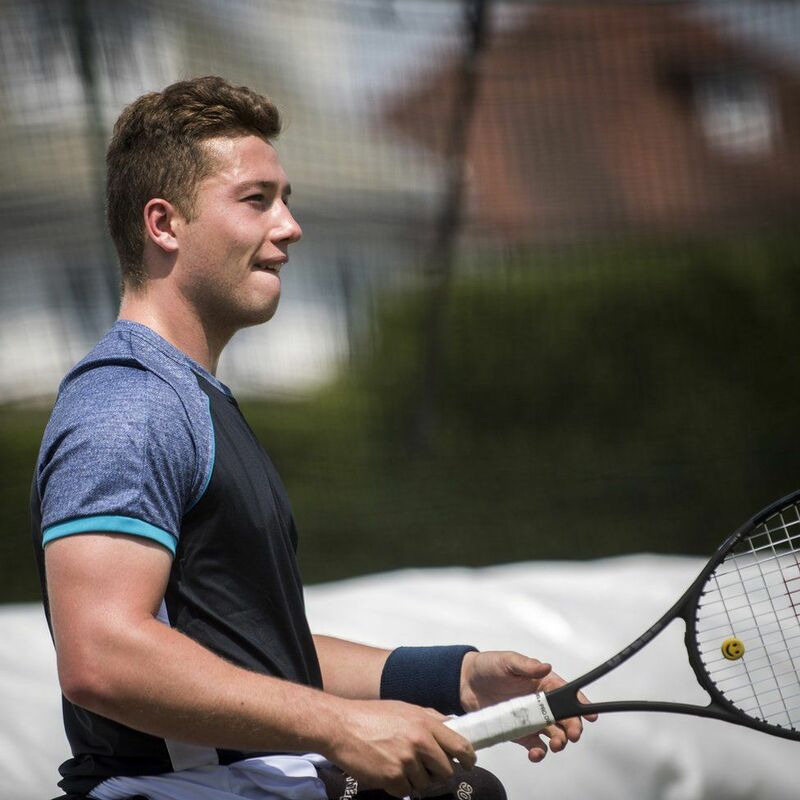 Hewett, 19, started playing in 2005 and was ranked world number one junior between 2013 and 2015. 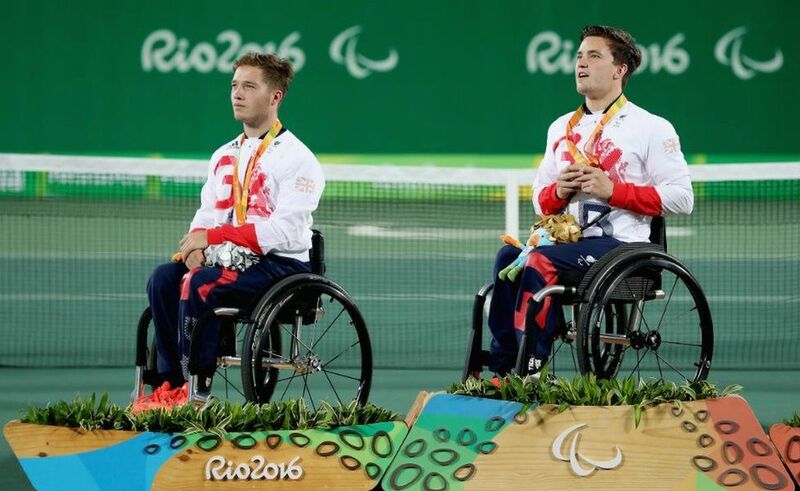 He made his Paralympic debut at Rio and took silver in the men's doubles with Gordon Reid. He also claimed silver in the singles after Reid defeated him in an all-British final. 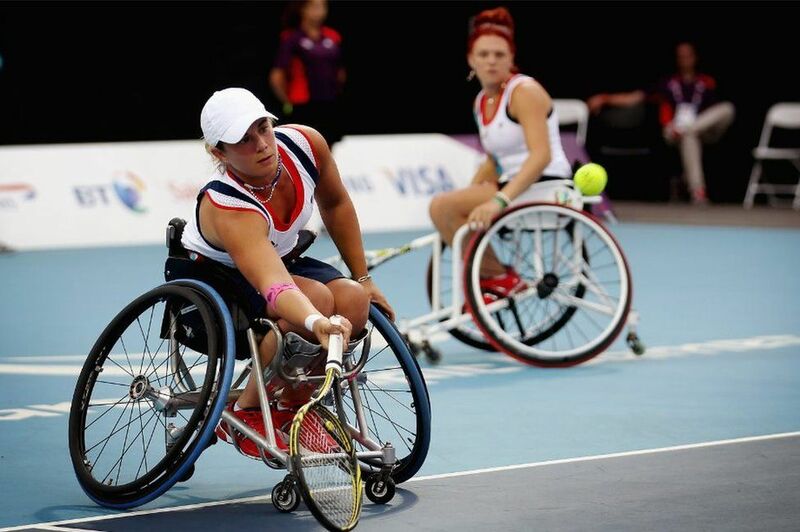 Shuker turned to wheelchair tennis after a motorbike accident in 2001 paralysed her from the chest down. She hadn't even been discharged from hospital before she tried the game. Having previously played badminton she went on to represent Great Britain at the Beijing, London and Rio Paralympics and was the first Brit to contest all four major Grand Slams. She says "when I first started everyone said I was too disabled" but she focused on developing a chair which could support her body. Shuker, alongside Jordanne Whiley, won Great Britain's first women's wheelchair tennis medal at London 2012 in the doubles. The pair defended their bronze in Rio. "My Nana said to me that I'd lost my sparkle after my accident, but that I'd found it again with tennis and it definitely made my body better so dealing everyday with disability is a lot easier." Ahead of this year's championship she's feeling strong. "I feel fit. I've been training hard and trying a style of play that will hopefully give me an advantage." 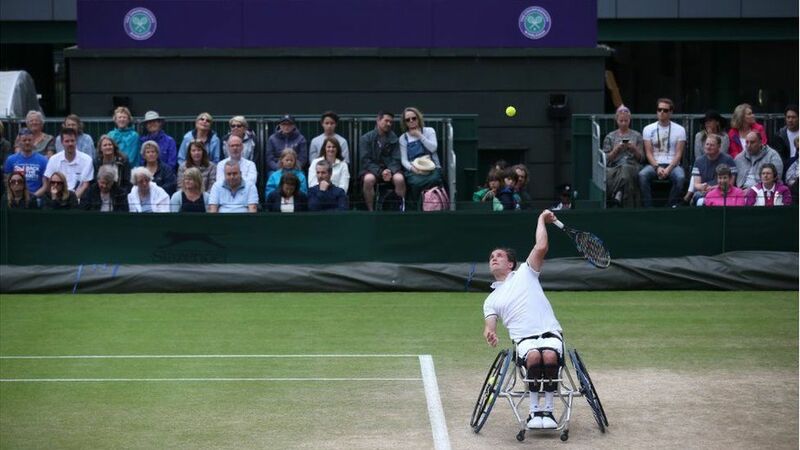 Is Wimbledon the biggest grand slam in wheelchair tennis? Talk to any of the Brits and it's a resounding "yes". "As a British player, Wimbledon's the one you grew up watching and everyone all over the world knows about it," Shuker says. "It's the hardest one because it's on grass, but it's an honour to play there. You've got the home support and it has that constant buzz like the Paralympics." It's not the only big event in the calendar. 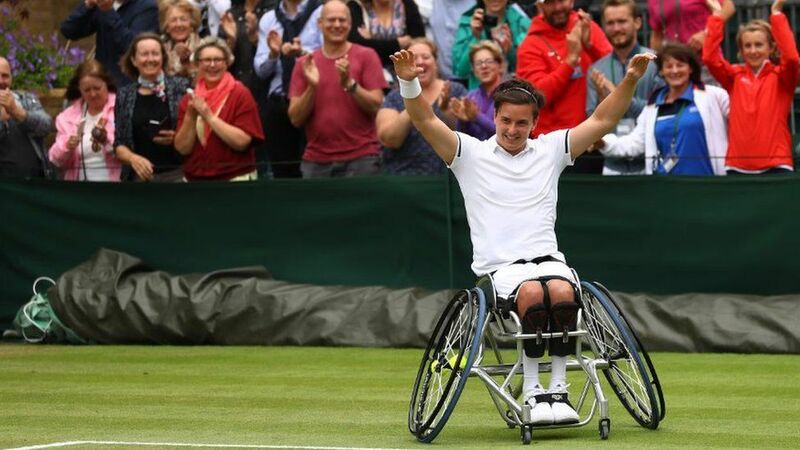 Grand Slams include the Australian Open, Wimbledon, Roland Garros, and the US Open as well as the Paralympics and The Uniqlo Wheelchair Tennis Tour with 150 tournaments and prize money totalling $2m. But, this is a new game, right? It was 1976 when former acrobat skier, Brad Parks, was injured and left paraplegic. During rehab, he met wheelchair athlete Jeff Minnenbraker and the two started talking about the possibility of such a sport. It was demonstrated at the 1988 Seoul Paralympics and became a full medal sport at the Barcelona Games in 1992. At London 2012 players from 31 countries competed. 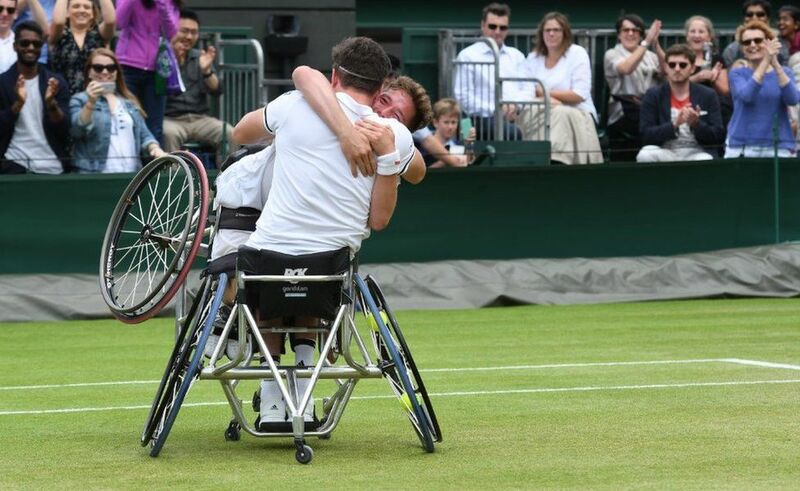 Wimbledon staged its first wheelchair men's doubles tennis tournament in 2005 and 2016 saw the first singles championship take place. Sure! There are currently 333 venues across the country with training facilities, but its advisable to give your local club, LTA or Tennis Foundation representative a call first. Richards says: "Most clubs are now accessible and a lot will have some chairs so that first experience can be good. "You can play in your day-chair, it's not prohibitive. As you get better at the sport, the chairs get a lot more expensive, but that's where we come in."